An easy way to conceptualize active filters is thinking about audio speakers. A speaker crossover has a low-pass, high-pass and band-pass effect breaking a signal into three components based upon frequency. In the previous part of this series I took that idea and applied it to a Universal Active Filter built with a single chip opamp based chip known as the UAF-42. By the way, it’s pretty much an older expensive chip, just one I picked out for demonstration. Using a dual-ganged potentiometer, I was able to adjust the point at which frequencies are allowed to pass or be rejected. We could display this behavior by sweeping the circuit with my sweep frequency function generator which rapidly changes the frequency from low to high while we watch what can get through the filter. In this installment I’ll test the theory that filtering out the harmonics which make up a square wave results in a predictable degradation of the waveform until at last it is a sine wave. This sine wave occurs at the fundamental frequency of the original square wave. Here’s the video but stick with me after the break to walk through each concept covered. Some ringing left, call it an artifact. When looking in the opposite direction using the high pass filter (and bandpass) we see that there is energy right at the rising edge of the square wave. This is the infamous “edge” or what I have referred to as “the bite” meaning that the energy is this rising or falling edge is what leaks out and gets into FCC emissions or picked up by analog circuitry. Looking at a square wave through a hi-pass filter. This rising edge can be described as representing part of an angular frequency, or Δv/Δt (pronounced “Dee Vee Dee Tee”) which is the change in voltage vs. the change in time. The faster the voltage change in a set period of time, the higher the equivalent frequency and energy. There is a whole slew of semiconductor devices that freak out a bit when faced with very rapid transitions: SCR’s, TRIACs, transistors, MOSFETs and even diodes have been known to turn on with high Δv/Δt. The good news is you can find this susceptibility in the appropriate datasheets. The rise time of a signal also has something to do with how much of the higher frequencies are present. 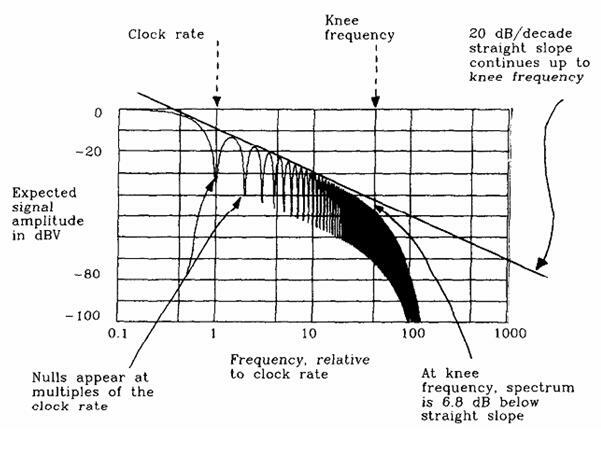 Simply put the faster the rise time the higher the amount of energy present in the RF spectrum. If you’re interested in the math, I have seen this represented as FKNEE = .5/TRise. FKNEE is the point in the frequency domain where the spectra of energy rolls off (6.8db in this case) and TRISE is the standard time it takes to get from 10% to 90% of full signal. You might find surprising the number and accessibility of good filter design programs available directly on the web. Texas Instruments’ Webench starts out by asking what kind of filter; low, band, or high pass and then allows you to pick the attributes you are designing for in general. The next step allows you to observe firsthand the effects of different types of filters and the results are instantly available. In the old days, (before VisiCalc) we might have to crank through the equations repeatedly searching for the best compromise. Finally the program shows a schematic and a Bill Of Materials of standard parts. Again this eliminates the need to try and keep solving for the right set of parts where real resistor values could be used (typically 1% resistors). Analog Devices Filter Wizard does essentially the same thing allowing the hobbyist or small lab the ability to define an accurate, effective filter without doing a single math equation using imaginary variables (such as the square root of negative 1). A good text back in the day was [Don Lancaster’s] Active Filter Cookbook, though my first exposure was from flipping every single page of the National Semiconductor Analog Databooks. Finally, if you want to keep exploring this concepts here’s a breadcrumb to guide you: Did you know you can use the phase shift of a filter to create a sine waveform generator or that you can reverse bias the emitter-Base junction of many common transistors to create a white noise source useful for testing filter (or sound system) responses? I like that he looks like Sid Haig in House of 1000 Copses! UAF-42? I’m having flashbacks (http://radiomuseum.org/tubes/tube_uaf42.html). You mentioned a Chebyshev followed by a Bessel, and that the Bessel filter does not have a group delay. – Does the Bessel filter actually restore the group delay that the Chebyshev caused when used like this? From what I have seen its more about the amplitude (and some hidden instability like undampened ringing near the ripple) so the Bessel will smooth the ripple and other stuff out while degrading the slope a little, but the Cheby/Bessel combination is better than either one for both smoothness and slope. I’ll have to revise all my textbooks with this new info. Pedantic note: The square root of -1 is j (for electrical engineers) or i (for physicists and mathematicians). My math teacher would be even more pedantic and say: j is the imaginary number for which the square equals -1. The square root of -1 doesn’t exist. “doing a single math equation using imaginary variables (such as the square root of negative 2 also known as j)” Should this be sqrt(-1) == j ? Or is this a notation or normalization specific to filter design? I hope to be able to show the complex number multipliers in FPGAs and DSP down the road and talk about imaginary and real components specifically. Filterlab by Microchip works offline and runs nicely under WINE. 1st result googling its name, URL is too long. Great video, Bil! I do have one question, though: Although you can’t use commercial music, there is plenty of freely-available royalty-free music that costs nothing. In particular, Kevin MacLeod has quite a number of varied compositions that he has available on his website, and the only licensing requirement is that you acknowledge that it came from him either in the video or the video description. It would be a lot easier to understand what the filter is doing if we can actually hear the output result. Where is this used practically? Could this be used for a high quality audio speaker crossover, or is this primarily for noise filtering?